This collection contains images of a variety of artifacts commonly found on archaeological sites and in museums documenting the Chinese migrant diaspora from the mid-19th through the early 20th century. The assemblage highlights artifacts from Chinese communities in Oregon and California in an effort to promote education and greater understanding of the role Chinese migrants played in the settlement and development of the American West. For more than 50 years archaeologists have been working on sites associated with Chinese participation in the gold fields, railroad construction and maintenance, agriculture, logging industry, fisheries and canneries, and urban settlements. 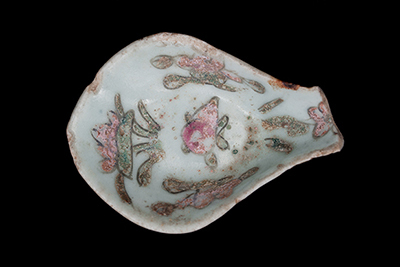 This collection was created as a means to standardize terminology, aid in artifact identification, and provide accurate information about the manufacture and function of a variety of everyday items used in early Chinese communities in the West. This collection was made possible through a partnership between the Southern Oregon University Laboratory of Anthropology (SOULA) and Hannon Library, and PAR Environmental Services, Inc. Priscilla Wegars, curator of the Asian American Comparative Collection at the University of Idaho Laboratory of Anthropology served as peer reviewer and advisor for the collection, and Kyle Crebbin, with SOULA, aided in the creation of the artifact metadata. Thanks also to Gary Weiss, Marjorie Akins, Kevin Akins, Ray von Wandruszka, and James Bard. This project was funded in part by the Jacksonville Friends of the Library. For more information and references cited within the metadata, visit the Additional Resources page for this collection.